I began flying kites in 1988. I was hooked the very first time I flew a stunt kite. After years of collecting kites, I learned to sew my first kite at a 1994 workshop hosted by the Kitchener-Waterloo Wind Climber Kite Club. Soon after that I became an active member of the club. I helped organize several kite flying events and workshops. I was also editor of the club newsletter for several years. Most recently I was the kite club president for over eight years. As a kite enthusiast, I also contribute event articles to AKA Kiting Magazine and some online magazines such as Kitelife and Gomberg Kites Updates. My articles include a story on Robert Brasington and another on a sewing technique known as appliqué. I also have an extensive Picasa photo album full of kiting events that I have attended. After years of making multi line kites, and single line kites, I now concentrate more on original artwork for single line kites. I also enjoy creating new inflatable designs. Sometimes for our kite club workshops and sometimes just for personal satisfaction. 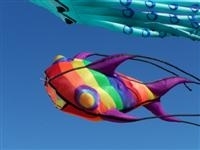 My kite travels have taken me to festivals and flying locations all over Ontario, Quebec and far beyond. Click on the high lighted cities that follow and you will see more of the kite articles articles that I have written. I have attended kiting events in Niagara Falls, NY, Ocean City, MD; Melbourne, FL; Baddeck NS; Dieppe NB; Varennes QC, Verdun, QC; Saint-Honore, QC; Swift Current, SK and Thunder Bay, ON. Nine butterflies. I hand them out at events to form a fun "Butterly Migration"
9 ft tall Crayons right out of the crayon box! Celtic Dogs, the most applique I have ever done on a kite. 7 1/2 ft high Club Rokkaku. Great fun in a Rok Battle! Jesus in the garden of Gethsemane Della-Porta kite. This was on display at our church as the first station of the cross. 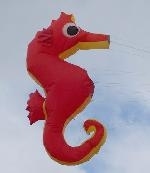 I also have some larger show piece kites for the big aerial display! Spike, the most children friendly inflatables around!